This durable case lets you conveniently carry the vehicle around to driving areas or races, and it's great for convenient, neat storage, too. Inside, you'll find the fully-assembled chassis along with a separate, lightweight body, plus tools, small accessories, a punch-out cardboard ramp for doing jumps, and all the batteries you need to get running. 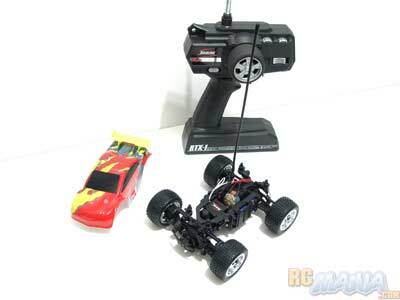 The controller is the best-looking I've seen on any toy-class RC, ever, with steering and throttle trims, three acceleration settings, and "dual rate," which basically determines the steering sensitivity. I really have to hesitate to call this a toy-class setup; everything about it looks professional hobby-style, it just has a low price. The low price, though, starts to make sense when you really start checking out the chassis. 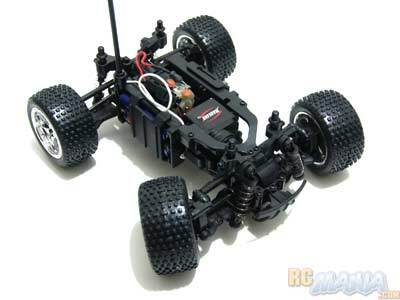 It has 4WD and independent suspension, but all of the parts seem really, really flimsy. I can hold one front wheel in place and turn the other one almost all the way to the left & right, just from the amount that the various plastic pieces bend & flex. It feels really fragile. Though the vehicle looks complicated, it's not hard to get it ready to run. Batteries are included and easy to install. Hiding behind the holographic silver lining of the box (that includes the ramp for jumping) is an instruction manual and a set of stickers you can use to decorate the body. It's important that you put on the antenna tube, and attach the body with four small metal clips. Extra body clips are included in case you lose one or two. I was immediately unimpressed by the Radline's speed on the street. I guess it's okay, but I was expecting a little more from such an advanced-looking vehicle. It's too fast to drive indoors, though, even though it's small. Steering, on the other hand, is amazing. I don't think I've ever seen a conventional 4-wheeled vehicle that can turn so sharply. It actually felt like the steering was too much, so I turned down the dual-rate setting on the transmitter to make it less twitchy. The truck has brakes that work really, really well, but acceleration is modest, even on the "level 3" setting. The result is that the truck turns and stops suddenly and doesn't like to coast forward, so it's hard to drive it smoothly. When I was buying this truck, I couldn't walk out of the store without picking up at least one upgrade, and I passed up the oil-filled aluminum shocks and ball bearing set to get a "Racing Pack" of three upgrade motors that includes a selection of alternate gears for more tuning options. At first I thought I could just pop the stock motor out and pop in a new one, but it ended up not being so simple, and I sent the truck over to the Professor for help, but not before I took some video! 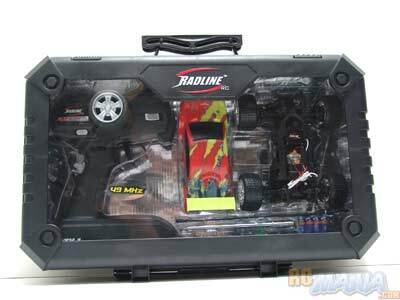 Ah, so this is the Radline RC many people have been waiting for, hmm? Well, it does seem flimsy, indeed. Oh, but changing the motor will not be difficult, you simply have to look at the manual! A screwdriver is even included, and you need nothing else. There are two screws on the top that you must remove, and four on the bottom. The screws, they are very small -- two millimeters in diameter -- so be careful not to lose them! With these six screws out of the way, the entire back section of the vehicle comes off. If the large white gear stays in the rear section, take it out (it's not connected). Now, there are two final screws to remove, the smallest yest, connecting the motor mount to the main chassis. Take these out, and pull out the electrical plug that connects to the main circuitry. Finally, un-snap the motor retainer from the mount, and at last the motor is free. If you want to use the same small ("pinion") gear with the new motor, remove it using the gear puller tool included with the truck. Agh! This was not simple at all! Two tiny screws here, four there, two tinier ones elsewhere, a gear, a strap, a plug, another gear -- and I don't even have the new motor in yet! Hmph! Alright, let me finish before I lose my patience! Pinion Speed Acceleration Climbing power Battery life Best for.. Spur Speed Acceleration Climbing power Battery life Best for..
You can mix and match your pinion and spur; all that matters is the ratio of sizes between them. Now, installing a pinion is easy, you just push it onto the motor shaft. To install the spur, put it on the small drive shaft sticking out of the front section of the chassis. Don't force it! You must align it correctly with flat section on the shaft, and it will slide on easily. Once you have the motor installed back into its mount with the snap-on strap (make sure the wires stick out the top, or it will not fit), you can re-insert the two tiny screws that connect the motor mount to the chassis, but don't tighten them all the way! The holes these screws go through are oblong and allow you to move the motor up and down before tightening them. This allows you to chose how to align the pinion and spur gears together. You should make these very close to eachother, but not completely tight! You should be able to move one gear ever so slightly with your hand without the other gear moving -- the teeth should have a very small gap between them. If you have too little gap, performance and battery life will suffer terribly, and your motor may overheat! Leave too much of a gap, and the power of the motor may overcome the strength of the gears, causing the teeth to slip, or even break off! Finally, you can reinstall the back end of the truck with the six remaining screws. Not a simple toy, at all! 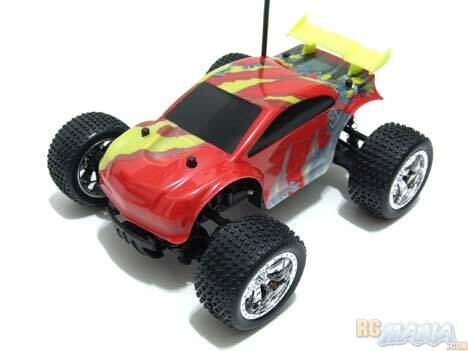 The Radline is a hobby-class RC, albeit a flimsy one! Well, after seeing all that, I have to agree with the Professor, this is not a mere toy. 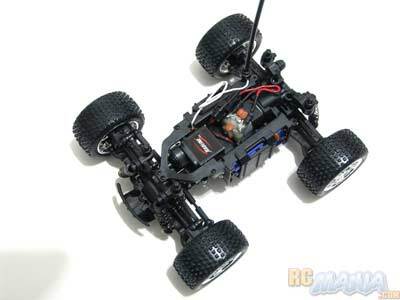 The complexity of the chassis is very advanced, and every part can be disassembled and changed individually. The manual shows an exploded view with part numbers for even every individual screw, so you can order replacements or see how to disassemble things for maintenance. There are a number of performance upgrades available, plus you can exchange parts between the three models. The main chassis assembly is nearly identical between the three, in fact, so you can put monster truck tires on the buggy, or by changing the body mounts you can put a buggy body on the stadium truck (etc.). Speed out of the box is lacking, but the ability to drive offroad somewhat makes up for this. What I worry is that kids young enough to appreciate the stock speed are going to experience breakages too frequently and have trouble working with the complex and tiny parts, while kids old enough to want more performance are going to be frustrated by the excessively flexible plastic & really imprecise construction. I think the starting price of $49 is good at first, but I fear that the cost of upgrades, replacement batteries, and broken parts can turn the Radline into an expensive investment that soon gets abandoned.